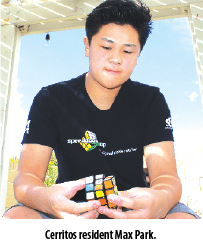 Cerritos is home to North America’s top ranked Rubik’s Cube Champion and his name in Max Park. Park is a 14 year-old boy with Autism who has placed third in the World Cube Association of Rubik’s Cube champions and has been ranked number one in California, United States and North America. Max has participated in twenty competitions in 2016 and earned first place in seventeen of those competitions. As part of his therapy, doctors recommended Max play with a Rubik’s cube. Schwan Park, Max’s Father told HMG-CN, “Initially working with the Rubik’s cube was aimed at working on his fine motor skills.” But it became much bigger than that. At the age of ten, the Parks took Max to his first competition to help with his social skills. Max made it to competition floor, solving the 6×6 Rubik’s cube in just 2 minutes and 57.66 seconds. “He was beating out other competitor’s by a full minute, and these were college age kids,” recalls Schwan. The win gave Max his first division title, placing him in the top 100 players in the world. Further, it was the 89th fastest time ever recorded. A Rubik’s Cube is a three-dimensional flexible puzzle with six sides containing colored squares. The goal is to spin the sides so each ends up with the same color. A standard cube has three rows of each color, but the puzzle comes in various sizes and Max can solve the puzzle faster than most people on the planet. In the beginning, Max tinkered with the cube, but really became enthralled while watching YouTube videos of people solving the puzzle. He then challenged himself to match their speed. As Max watched the other competitors, he memorized their moves. Park is headed to the Nationals this July to compete against the world’s best players. His parents have created a “gofundme” page. If you would like to help Max get there, please visit www.gofundme.com/evmsddes .